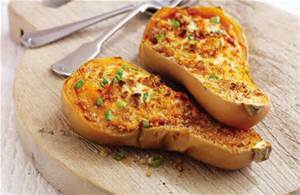 If you haven't tried butternut squash for a while, then this recipe is a must for a midweek winter meal on a cold and wet evening. It's a very filling dish, so don't plan anything too energetic after eating it. Real yummy comfort food! Heat the oven to 190'C or Gas Mark 5. 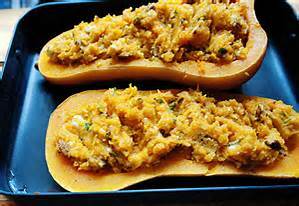 Prick each butternut squash several times and bake in the oven for 40 minutes. Leave to cool. Meanwhile, heat half the oil in a frying pan, add the onion, garlic, thyme and coriander and fry gently for 10 minutes. Heat the rest of the oil in another frying pan and fry the breadcrumbs for 4 minutes until crisp and golden. Cut each squash in half lengthways and take out the seeds. carefully scoop out the flesh, chop finely and tip into a bowl. Stir in the onion mixture, breadcrumbs, walnuts, tomatoes and basil and add a good dash of salt and pepper. Divide the filling among the squash shells and top with the goats' cheese. Bake in the oven for 30 minutes before serving hot.